Mother and Child is a powerful art house film that surveys the lives of three women, all dealing in different ways with how their children impact their lives. The movie was sadly overlooked during its limited theatrical run this summer, bringing in slightly more than $1 million. Like fellow countryman Alejandro Gonzalez Inarritu (Babel, 21 Grams), writer/director Rodrigo Garcia (Nine Lives) of Mexico specializes in multi-character films with a group of different story lines that eventually converge Crash-like on screen. 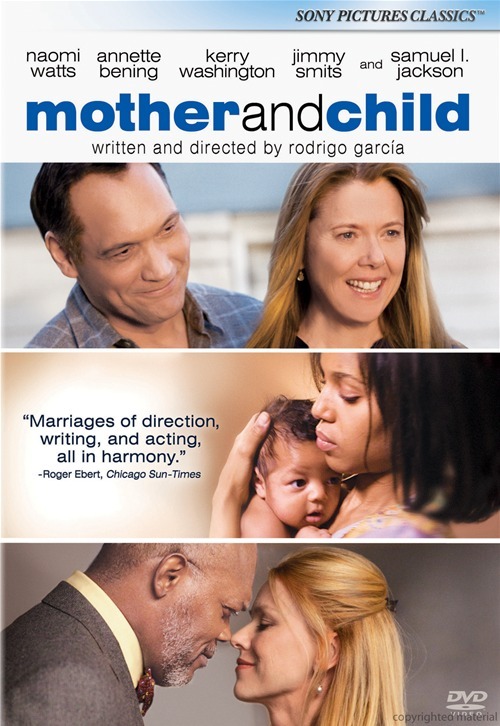 The women of Mother and Child include a resentful physical therapist (Annette Bening, American Beauty) who gave up a child for adoption when she was a teenager; an icy, beautiful and restless lawyer (Naomi Watts, Fair Game); and an infertile African-American woman (Kerry Washington, The Last King of Scotland) with a strong desire to adopt a child from an orphanage. The lives of all three women eventually intersect, often in surprising ways. While some of the connections between the principal characters feel a bit contrived at times, there’s no shortage of emotions-baring dialog and exemplary acting on hand, including fine supporting turns by Samuel L. Jackson (The Spirit) as Watts’ boss and lover, Jimmy Smits (TV’s Outlaw) as a nice guy Bening warms up to and Cherry Jones (Amelia) as an orphanage advisor. It’s all bolstered by a compelling screenplay that might make audiences tap into their own experiences in relation to the movie’s themes. Although the film didn’t get the play the lighter Bening-starring domestic story The Kids Are All Right did earlier this year, Mother and Child is every bit its equal, deserving attention from serious moviegoers who like their dramas to be both troubling and stirring, often at the same time. Special features on the DVD include a commentary by Garcia and a featurette that finds the cast showing a whole lot of enthusiasm about their undertaking. Okay for a start, the CAST for this film is officially in the order of Naomi Watts, Annette Bening and Kerry Washington. Regards.